On April 3, Verizon Communications Inc. (NYSE: VZ) introduced the nation's first 5G network services in Chicago and Minneapolis, kicking off one of the most explosive tech investing opportunities we've seen. Verizon's rollout of its 5G network was largely brushed under the rug by major media outlets. They dismissed it, citing spotty coverage and limited accessibility as reasons to ignore the breakthrough. But they're missing the big picture. 5G Could Mint a New Wave of Millionaires: The greatest tech shift in generations could be about to create untold wealth for investors. To find out how you could capture a life-changing SIX-figure windfall, go here now. The truth is Verizon's breakthrough is just the tip of the iceberg in the 5G revolution – and investors should be racing to get in on the ground floor as Verizon breaks the latest tech glass ceiling. If Verizon's rollout of 5G technology seems limited, that's because the company is merely in the early stages of providing full nationwide coverage of 5G wireless service. 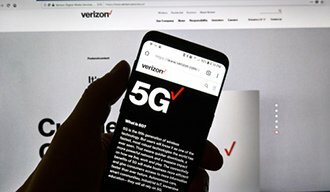 On Feb. 20, Verizon announced that it plans to offer 5G coverage in 30 American cities by the end of 2019 – a major step forward in making 5G coverage accessible across the continent. And Verizon isn't the only big-name firm chasing nationwide 5G distribution. AT&T Inc. (NYSE: T) is moving to introduce high-quality 5G service to nearly 20 cities in 2019. Plus, AT&T is already trying to tap into the hype with its "5G Evolution" campaign. Meanwhile, Sprint Corp. (NYSE: S) is pushing to match Verizon's 30-city commitment over the same time frame. As you can see, competition for 5G superiority is fierce – and for good reason. 5G technology allows data to be sent and downloaded at speeds previously considered impossible. According to recent speed tests, 5G is approximately 20 times faster than 4G streaming speeds, offering a peak minimum download speed of 20 Gbps. Not only does this kind of speed make streaming services lightning fast, it enables us to integrate digital technologies with devices that were previously unthinkable. And in doing so, it will allow companies to develop entirely new products – and generate fresh profits.